How does a working single mother with a high-stress career transform into a competitive figure athlete? Just ask Carisa Wherry. She did it all! Being a physique competitor is often a solitary pursuit. Sure, many can boast a supportive team of friends, family, and trained handlers who provide encouragement and advice along the way. But when it comes down to the workouts, it's just you putting in the reps. It's your sweat, angst, and energy that go into building a standout body. Well, not for Carisa Wherry. In preparation for her first-ever physique competition, the NPC Rocky Mountain this November, her training ritual quickly grew into a family affair. Each day, she was joined at the gym—at 4 a.m., no less—by her sister, a friend, and her 62-year-old mother. As she lifted and did cardio with her vision of a perfect figure shape in mind, her family worked on their own fitness goals: her 62-year-old mom to improve her health, and her sis to lose a bit of weight. "It was encouraging to see their transformation during my contest prep," Wherry says. "They would help me get up and do my cardio with me." The team effort didn't stop there. Often, Wherry's 12-year-old daughter was waiting for the four at the gym, and when she wasn't, Wherry's father would wake up early to be with her. Wherry's good friend Anthony Harvey also stepped up, arranging her travel, cooking her meals, managing her schedule, and, as she says with a grin, "putting up with a lot of attitude." You'd think with all that help, Wherry must be a seasoned fitness veteran. The truth? She just started this a year ago, at age 40. It wasn't that long ago that Wherry turned to fitness with the same goals as her mom and sister. A collegiate track and field athlete, her activity level declined after graduation when the normal plot points of career, marriage (then divorce), and child intervened. "In order for me to stay healthy, even mentally healthy, I needed to find something. The gym became my outlet. Now, I feel so much stronger, like I can do anything. It definitely makes me a better detective." "Life happens after you finish college," she states simply. "And I didn't go to the gym, because I wasn't good about finding time." At first, like most people, she wanted to work out just to feel better and manage stress. Wherry's job is particularly intensive. By day, she's a detective in the missing and exploited persons unit of the Denver Police Department, specifically doing follow-up investigations involving children. Much of what she investigates are cases of physical abuse, sexual abuse, and neglect. "I've been on the job for 14 years, and it is very important to have a stress reliever, because our job is very stressful," Wherry says. "Luckily, the Denver Police Department promotes health and fitness." In the department's program, Wherry earns "points" for going to the gym and other healthy activities, which in turn helps her garner extra days off. "It was the initiative I needed to get back into the gym," she says. "In order for me to stay healthy, even mentally healthy, I needed to find something. The gym became my outlet. Now, I feel so much stronger, like I can do anything. It definitely makes me a better detective." Quickly enough, Wherry's stress outlet became far more than that. As many have experienced before her, feeling good and improving athletically became passions that branched out beyond the gym. "I could tell when I ate food that my body didn't respond well to—my performance in the gym would suffer," she recalls. "So, naturally, I started eating better and cleaner." This, in turn, helped Wherry further boost her energy levels and perform better mentally and physically. Of course, it didn't happen all at once. 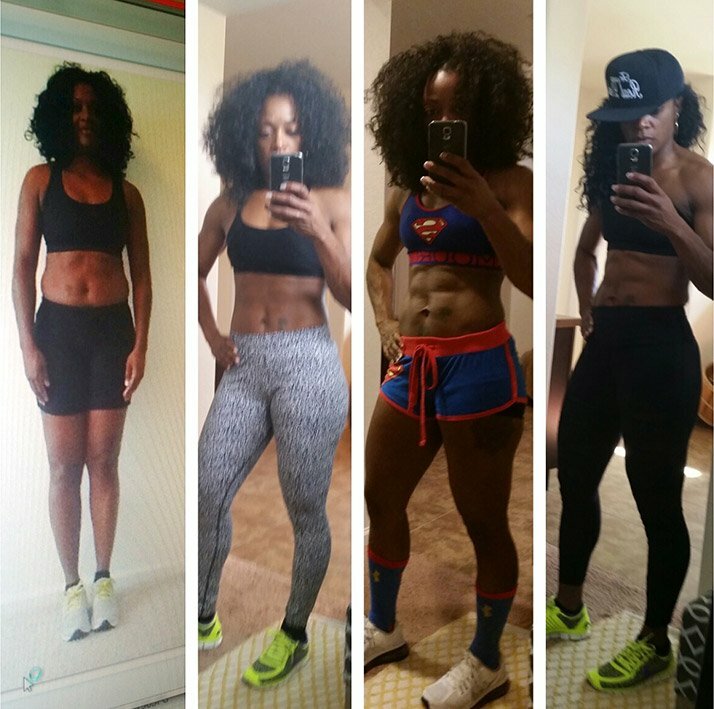 "I was only able to see tremendous results when I was able to get my weight training, cardio, and eating all in hand," she explains. "I was only able to see tremendous results when I was able to get my weight training, cardio, and eating all in hand," [Wherry] explains. After less than a year of working out, a friend approached her about entering a women's physique competition, which she did in March 2015. But when she saw the figure contestants in person, she changed course. "I saw the girls wearing the heels and I said, 'Oh, I want to do that!'" Wherry says. Just a few months later, she had her chance at the Rocky Mountain Championships, and the results were impressive, particularly given how short the journey has been. She took first place in masters figure, overall figure, and novice figure. So was this a one-and-done? Is it out of her system? Anything but. Wherry says she's now ready to move on to more shows in 2016, thanks to the team around her. "I have the biggest support system around me—I couldn't ask for anything better," she says. "They motivated me. They were at my show, and even before I stepped onstage, I felt like I won because I accomplished a goal that I set out to do. It just made it sweeter that I did so well and that my family and friends were there. It was amazing."